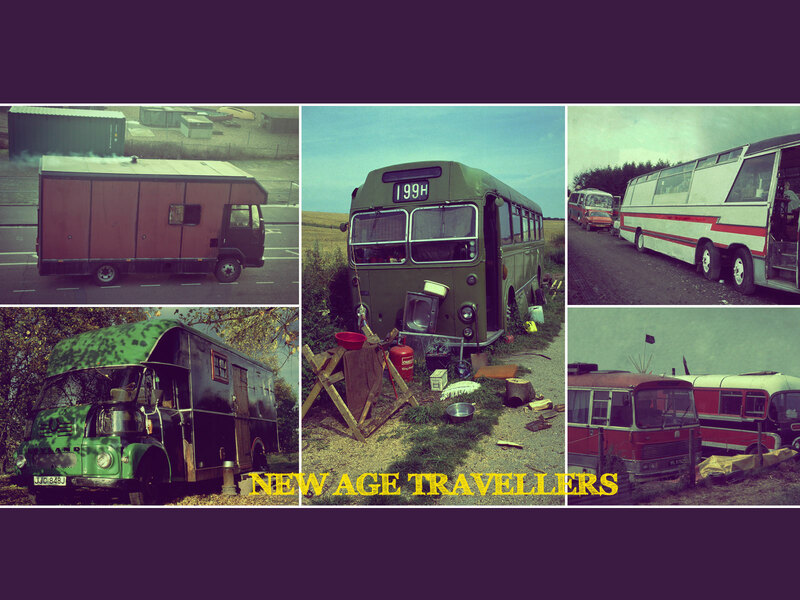 New Age travellers appeared in 1980s and early 1990s Britain. In the UK during the 1980s the Travellers mobile homes (trucks, old vans, and buses) moved in convoys. New Age Travellers are groups of people who often espouse New Age (“hippie”, “gypsy”) values, and travel between music festivals and fairs, in order to live in a community with others who hold similar beliefs. New Age travellers is a generic term which has been widely used in the media, but rarely among participants, to describe groups of scruffy young people who have apparently dropped out of normal society and have chosen to take to the road in convoys of battered old vehicles. There appears to be an urban variation on this grouping who are commonly involved in squatting in previously unoccupied housing. Eschewing traditional forms of employment, many (by no means all) live off welfare benefits, begging, and petty crime. Many of these young people perceive their problem to be a Britain in terminal economic decline which has failed to deliver the consumer affluence promised by post-war capitalism, while many others have chosen to reject the values of materialism. For these people (not all New Age travellers are young), the solution to their problem is to establish an alternative life-style outside of straight society. Many among their number consider themselves to be anarchists and belong to overtly anti-capitalist groups such as Class War. It would be inappropriate, however, to consider all those young people labelled as New Age travellers to be a close-knit politicised homogenous grouping. The level of commitment to anarchist politics is undoubtedly variable, but there does seem to be some general commitment towards antiauthoritarianism, a rejection of the traditional party political system which is considered irrelevant, and an enthusiasm for predominantly green politics centring on single issues such as animal rights and the fast-expanding antiroads movement (a group of protesters who physically challenge and obstruct the road building program in Britain). It will be the case, however, that some adherents to mis life-style have little enthusiasm for more overt political manifestations of this subculture but quite simply enjoy the freedom from the rat-race of conventional society and the pleasures of copious quantities of alcohol and drugs. There have been some quite close links between New Age travellers and the Rave culture and there are some apparent crossovers between the two groups. Some students and other groups of young people share serious political concerns for environmental and animal rights politics and many of these are on the fringes of New Age culture if only on a weekender basis. Some groups of young people seem to have affinities with more than one contemporary subculture and are not easy to categorise. Thousands of people still live a traveller lifestyle in Britain. As of 2010 they are normally known simply as Travellers. Although most Travellers in UK are British, large numbers of Europeans also travel in the Britain.